goldenblossomhoney.com is committed to respecting your privacy. We have created this privacy statement in order to demonstrate our commitment to our customers. 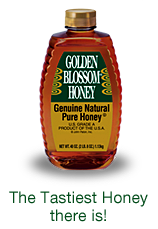 1. goldenblossomhoney.com does not rent its email or postal addresses. 2. We will never give any information about you to others without your express permission unless we are required to do so by law. The only exception to this rule is in the case of legitimate service providers (see more below) such as our email/newsletter service provider. Contest & Surveys: Our site occasionally runs contests and surveys in which visitor information is requested. Since participation is totally voluntary, customers may decide whether or not to disclose the information requested which may include contact information (name, shipping address, etc. ), and demographic information (gender, age range, etc.). This information will always be used responsibly to notify the winners and award prizes. Survey and demographic information will be used to improve visitor use of and satisfaction with this site. Newsletters: If a user wishes to subscribe to our newsletter, we ask for contact information such as name and mailing address. Other visitor information may be used to customize the newsletter content and offers for that individual. Security: goldenblossomhoney.com is committed to keeping the data you provide us confidential. Agents, contractors or partners of goldenblossomhoney.com who have access to your personal information in connection with providing services for goldenblossomhoney.com are required to keep the information confidential and are not permitted to use this information for any other purpose than to carry out the services they are performing for us. Service Providers: To the best of our knowledge our newsletter-publishing service and other agents, contractors or partners do not retain, share, store or use personally identifiable information for any secondary purposes. If by some chance they should use any data from this site without our permission, we disclaim legal liability for their actions. Links: This site also contains links to other sites. goldenblossomhoney.com is not responsible for the privacy practices or the content of such web sites. Children's Privacy: goldenblossomhoney.com believes that it's especially important to protect children's privacy online and encourages parents and guardians to spend time online with their children to participate and monitor their Internet activity. If you would like to contact us about your child's personal information, please contact us through any of the methods listed above. The information on this site is provided for your general reference and is not a substitute for consultations with qualified health professionals. It is not intended as medical advice. You understand and agree that the owners of this site shall not be liable for any direct, indirect, incidental, consequential or exemplary damages, including but not limited to, damages for loss of profits, data or other intangible losses (even if the owners of this site have been advised of the possibility of such damages), resulting from the use or the inability to use the product(s) and or service(s) or any misuse of the product(s) and or service(s) in a manner not in accordance with their intended use. At goldenblossomhoney.com your privacy is important to us.